As it turns out, in all the years I rode my Kenda Kozmik Lite tires (the originals that weighed 395g) with the FlatAway installed, I never once got another flat tire due to a puncture. I got a few punctures for a stretch of time due to my rim tape shifting and exposing spoke holes, but nothing ever got to me from outside the tire. After getting a couple flats recently due to sharp crushed shale rocks on a local rail-trail, I decided it was time to install some FlatAway in my Kenda Klimax Lites. I still run the LunarLite tubes, which really don’t puncture much easier than standard tubes, despite their thin material; if a rock or thorn can take out one of these, it’s definitely going through a standard tube just as easily. The only place the LunarLites don’t stand up as well is when it comes to pinch-flats. So, for my long Katy Trail ride planned tomorrow, I figured I could either run without a liner and risk annoying flats, run heavier tubes, still risk the same flats, only have more rolling weight to contend with, or add 28g per wheel and not have to think about anything slowing down my ride. Now, let’s pretend a standard tube, weighing in around 165g, actually had the ability to hold off a puncture from a tiny, sharp rock. I’d still have 165g to move per wheel. 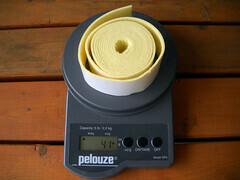 With LunarLites and FlatAways, I have an 82g tube + 28g liner, for a total of 110g per wheel. No matter what, I’m already ahead of the game. However, like I already said, I’ve never had a puncture with these liners. I have, however, had plenty of punctures with standard tubes. So, not only do I have less rolling weight, I have a much better chance at not getting a flat along the way. Installation of the FlatAways is pretty simple, although it is a little trickier than it’d first seem. First off, you have to make sure you’re installing the adhesive backing on a clean surface if you want to be sure it won’t ever shift to the side. I always coat my tubes in baby powder to keep them from sticking to the insides of my tires, so I had to thoroughly clean the insides of both tires ahead of time. Even if you don’t baby powder your tubes–and you really should–you should still give them a nice wipe down just to make sure they’re clean. Give them a few minutes to dry, too. Next, place a tire on a flat surface. I did the first one on my patio, but wised up and did the second on a table so it wouldn’t kill my back. Then, put your head through the tire, and rest it on your shoulders. This will help keep the bottom of the tire flat against your work surface, and it makes it easy to turn it as you go. 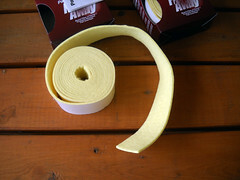 Peel back one end, and place the liner directly in the center. Slowly work your way around the tire, using a good amount of pressure on the liner as you stick it to the tire; remember, you don’t want this stuff coming back off. Don’t stretch the liner, and try not to let it get lumpy. As you get near the end, you’ll probably have a few inches of material left over. I typically overlap by about an inch, and then cut off the excess. This stuff is difficult to cut, so make sure you use very sharp scissors or you don’t stand much of a chance. Press the overlapping piece to the other end as hard as you can, since it doesn’t want to adhere to felt as well as rubber. Now all you have to do is install it like normal on your wheel and inflate your tube. I’d suggest letting it sit overnight the first time so the adhesive has time to fully bond, and then you should be ready to go. I rode those old Kozmik Lites for about 6 years, on everything from road to rail-trail to singletrack, and the liner never moved. I also never got a puncture, but I mentioned that already. That doesn’t mean I’ll be as lucky this time around, but if I had to place a bet, it’d be that I won’t have to worry about flats again. I’ll do a follow-up review in a few months and let you know how it holds up. 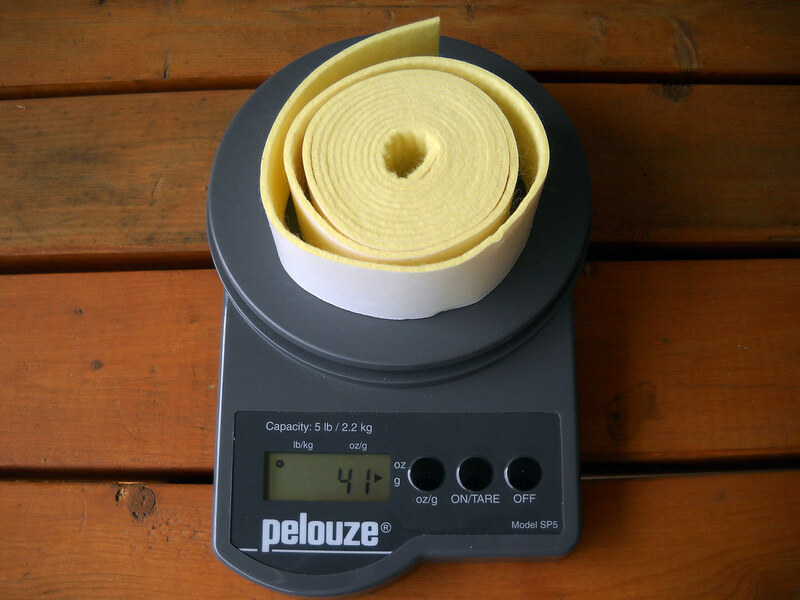 Weight out of the package is 41g per roll. However, that includes the wax paper and leftover liner. I weighed the excess backing and liner when I was finished, and it was 13g, bring total liner inside my tire to 28g. By the way, this is the 40mm MTB/BMX liner. Panaracer also offers FlatAway in a narrower road tire width, which weighs even less. 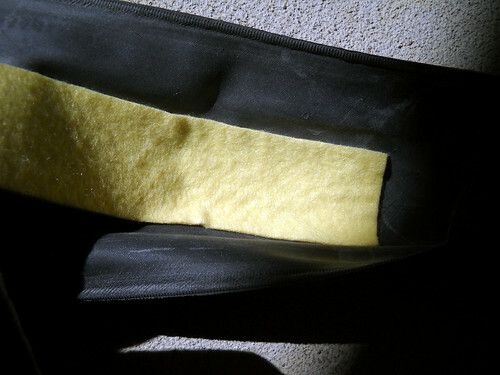 Sidenote: I’ve also used SpinSkins tire liners in the past, and didn’t have very good results. For one, they aren’t adhesive backed, so they are difficult to hold in place while you install a tire and tube on a wheel. They also break down over time, eventually breaking, and then the sharp broken edges puncture your tube from inside the tire. 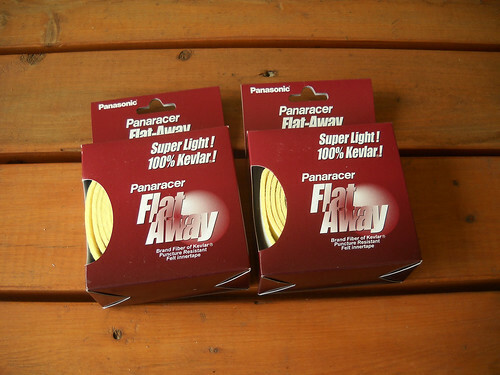 FlatAways have the advantage of being cloth-like, so they can never get brittle and break, plus they roll smoother than a harder material like SpinSkins. They also don’t shift after proper installation, so mounting or dismounting a tire is no more difficult than normal. How have they been holding up? I just put them in my 700c road bike, which suffered a puncture EVERY RIDE. 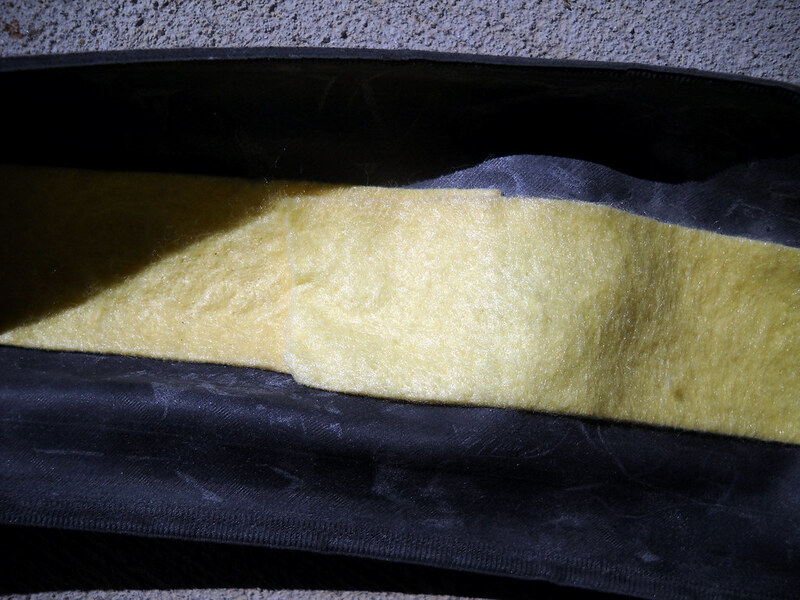 I hear the felt lining can also wear-away, leaving Kevlar fibers to slowly sand away at your tube…and I run expensive Latex tubes. I only have a couple hundred miles on this pair, but my old pair held up for years. I seriously never had a puncture, and if they had any adhesive left on them, I could easily put them in another pair of tires. I never had them cause damage to a tube, and I use Forte/Performance Lunar Lites, which are paper thin. Do you think they will fit in a 23mm tyre? Yes, but probably no smaller than a 23c. And make sure you buy the correct model; one is wider for MTB tires, and the other is narrow enough for road tires. I agree with the review, I’ve used these on all my bikes for about 4 years and no flats yet either from the objects penetrating the tire thread and through the liner or from the liner itself. I’ve pulled glass, bits of wire, thorns, and tacks out of my tires but no flats which I would have had had I not used the Panaracer Flat Away liners based on the penetration holes I found when I replaced a tire. I was able to pull off a liner and put it into a new tire, it did sort of stick but not nearly as well as it did the first time, I doubt it will stick at all the third time. Even though you have to stick Panaracer Flat Away to the inside of the tire which seems like work, it’s actually way easier then putting in the non-stick variety and then wondering if the liner slipped and not in the right spot once you have the tire installed. But keep in mind, the first line of defense against flats is the tire, then the liner, then the tube which I put little emphasis on the tube for protection. So if you’re getting too many flats from thread penetration try a better tire then add a liner. There is a trick that I do, I no longer put the liner in the front tire because the front gets way less flats then rears get so why bother putting one on the front? And front flats are fast and easy to fix anyways. So get decent flat resistant (no tire is flat proof) tire and buy just one liner and put it on the rear tire if you find the liner to be too expensive to put in both tires. So how has it been holding up? Any issue w/ the limestone shards on the katy trail? Getting ready to ride the trail in a few months and looking into best tire, tube, liner combination. What you’ve written here sounds great. In over a decade of using this brand of liner, I’ve only ever had one flat due to a puncture through the liner*. It was a piece of hard, jagged metal, and destroyed my tire casing, on top of also going through the Flataway. Cyclist Pepper Sprays Loose Dogs, Owner What Counts as a Century?